April 5, 2016 –Pensacola, Fla. – The Pensacola Grand Hotel will soon end its affiliation with InterContinental Hotels Group as a Crown Plaza hotel. 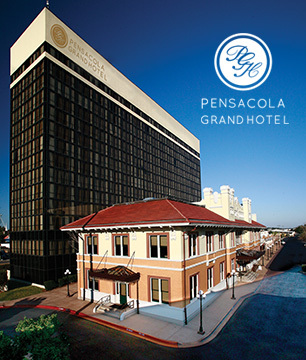 Beginning April 15, the Pensacola Grand Hotel will operate as an independent hotel while undergoing extensive renovations. Upon completion of the renovations, the hotel will affiliate with Hilton Hotels and Resorts as a DoubleTree by Hilton. The remodeling and improvement project is expected to take approximately one year to complete and will make the hotel consistent with DoubleTree Hotel standards. Renovations will be done in stages, and the hotel will remain open throughout the entire project. Enhancements will be made to all the hotels rooms, the lobby, banquet facilities and meeting areas. Though the hotel will undergo extensive modifications, McKay maintains that all historic features will be preserved and restored. No staffing changes will take place during the yearlong transition to its new flagship as a Double Tree by Hilton, according to McKay. The century-old Pensacola Grand Hotel has a rich heritage. Built in 1912 on the site of the historic L&N railroad passenger depot, the 15-story hotel features a lobby, lounges, restaurant, bar, shops, meeting rooms, a grand ballroom and more than 200 guestrooms.